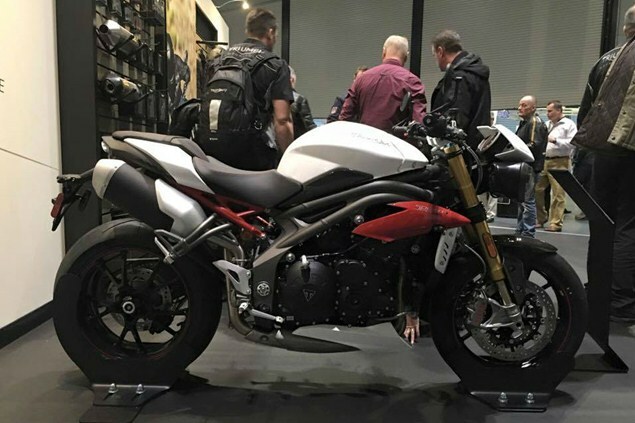 HERE’S Triumph’s still-secret 2016 Speed Triple R pictured at a recent dealership event ahead of its official debut. We’ve already seen the finished bike in a spy shot (which was sharper than this) but this is the first look at it without a Triumph test rider in the way. Clearly visible are the new radiator side panels and seat. The tank and belly-pan are also new, and the exhaust has been revised, presumably for lower emissions. Although we can’t make it out here, the fly screen has been reshaped and a new central air scoop added above the fox-eye headlights. Triumph sent a survey to Speed Triple owners earlier this year which suggested the 1050cc three-cylinder engine could get a power hike from 133hp to 140hp. The survey also suggested the new bike’s tech will include traction control, multiple engine ‘modes’ and electronic throttles. That seems all the more likely now Truimph has revealed an all-new Bonneville range with similar electronic trickery. The R version's Brembo brake calipers are now shared by the base edition Speed Triple, as seen in a spy shot back in February. But the Speed Triple R keeps its high-spec Öhlins suspension while the base edition retains Showa units. It’s not clear exactly what the new model was doing at a dealership or what the event was. A Triumph source would only say ‘Dealers do not understand confidentiality’ after pictures emerged on social media. It tells us that an official unveiling, launch and on-sale date cannot be too far off.